As Bonnie Pfennighaus and Louise Baraw reflect upon their lives, an extraordinary story of giving back, of caring for others emerges. But for the longtime friends a lifetime of caring for people is not enough. Now retired and living in Southern Shores, they want to ensure their legacy will continue. “We were modifying our wills, and our attorney, John Graham, said, ‘You were nurses for a long time, why don’t you use that money for a nursing scholarship,’ ” Bonnie recalled. The friends went beyond setting up an endowment for a nursing scholarship. They also have created legacy endowments through the Community Foundation in their wills for Food for Thought and the Outer Banks SPCA. “That (endowments) was something that never crossed my mind,” Louise added. 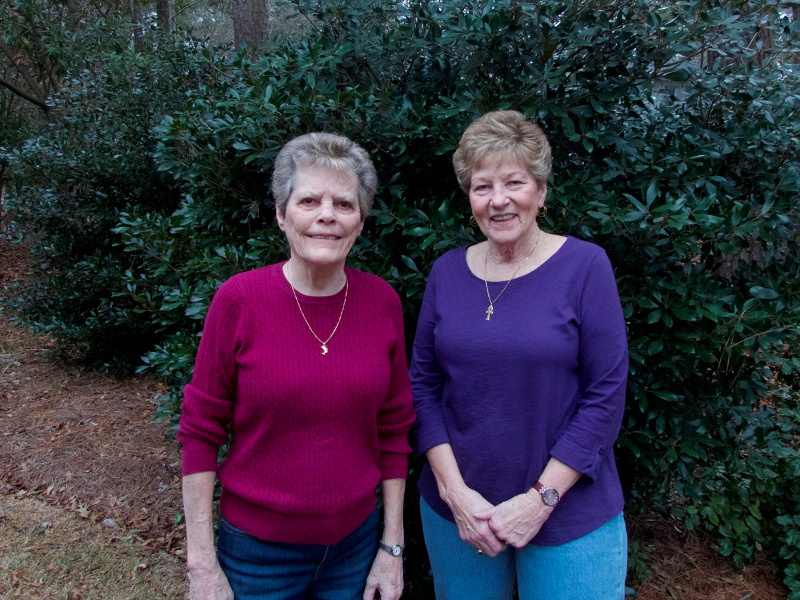 Louise had been a pediatric nurse, Bonnie a critical care nurse when they lived in Boston. They came to their profession from different places, but for both, it was the opportunity to help others that seemed to motivate them. Bonnie seemed to almost stumble into nursing, finding an interest in medicine when her father forced her to take a job at age 17 in her hometown of Warren, Ohio. After sabotaging every option he suggested, he took her to the local hospital where an aunt worked. There was no getting out of that, but to her surprise, “I loved it,” she recalled. In 1980 they retired from nursing and began second careers as deputy sheriffs in Vermont. “My dad got us into that. My dad was a deputy sheriff and my mom was a deputy in the courts,” Louise explains. For the friends, after years of dealing with life and too often death, the new job was a relief. “It was nice. We got kids in there we had to take care of and I knew that they weren’t going to die on me,” Louise said. Although as deputies there were certain things they were supposed to do in certain ways, according to them, some rules were bent. Often tasked with transporting patients to the state mental hospital, the regulations called for them to handcuff the person being transferred. The first person they transported after graduating from the police academy seems to have established how they were going to go about their job. The assignment was on the Fourth of July and it was an elderly lady. “We did stop in Montpelier so we could watch the fireworks,” Bonnie said. “We had such a good time with her,” Louise said. The stories they tell of their time as deputies are filled with small kindnesses, of treating people as individuals and with dignity. “You cannot act like somebody you’re not,” Louise said. In 1996 the friends retired and moved to the Outer Banks. Over the years they have volunteered for a number of community causes, including the Southern Shores Volunteer Fire Department, their church, Kitty Hawk United Methodist, and Food for Thought, a volunteer organization that packs lunches for Dare County school children. The act of giving back—of assuring that their legacy of caring will continue—has become important to the two of them. “If I should die tomorrow, God forbid, I want something that says, ‘Here it is. Let’s do this,’ ” Louise said. The Outer Banks Community Foundation is a public charity that connects people who care with causes that matter. The Community Foundation manages $17 million in 175 charitable funds for individuals and agencies, awards grants to local nonprofits, administers 50 scholarship programs, and provides tailored services to help donors pursue their charitable interests. Since its inception in 1982, the Community Foundation has awarded more than $8 million in grants and scholarships to local nonprofits and students. Anyone can start a legacy fund with the Outer Banks Community Foundation. For more information about starting a fund, please see www.obcf.org/giving/create-a-fund. For more information about planned gifts, see www.obcf.org/giving/david-stick-legacy-society.